There are a total of 206 bones in the human body. These bones are collectively known as the human skeleton. Generally, these bones are classified in two major types, axial skeleton and appendicular skeleton. Axial skeleton has a total of 80 bones and appendicular skeleton has 126 bones. The longest, largest and hardest bone in the human body is the thigh bone, also known as Femur. Femur, the longest bone of our body is located between your knee and hip. This bone makes up about one-fourth of a person’s overall height. It has the patella or knee cap at the bottom and pelvis at the top. It allows us to use our leg for movements. The femur also helps us in standing, walking and running. This bone can be considered as an organ. Femur is a fairly distinct bone because of its high level of robusticity. It is a weight-bearing bone. It is a very long bone and it contains both red and yellow marrow. Femur is very light in weight but this hollow bone is considered stronger than concrete. It takes a lot of force to break this bone. Car accidents and falling from an extreme height are two most common reasons for the fracture of thigh bone. This bone is connected with the hip by a ball and socket joint that allows it the freedom of movement. Early complications of fracture in the thigh bone include compartment syndrome, fat embolism and shock. Declan, Tobin. " Femur Fun Facts for Kids ." Easy Science for Kids, Apr 2019. Web. 23 Apr 2019. 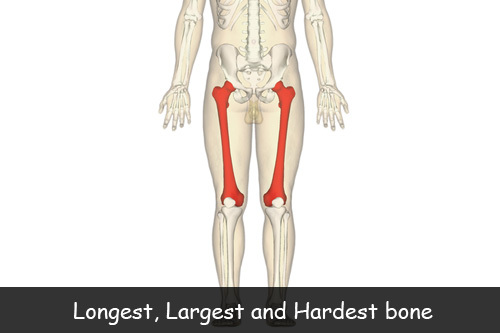 < https://easyscienceforkids.com/femur-longest-largest-and-hardest-bone/ >.